The Holy Spirit surrounds and guides our creative worship in a traditional setting. From the moment you enter our sanctuary, you will hear the buzz of connection with one another and sense that we are alive in God. In the sharing of the Word, we seek to be formed as the people of God. In the waters of baptism and the breaking of the bread in Communion, we are attentive to the Risen Christ in our midst. Weaving song and prayer together, we deepen our connection with Holy Spirit. Worship is that sacred space in the week when we connect with God and with one another. Each week, like most Protestant churches, we sing, read scripture, and pray. We also listen to amazing music from our music team and choir, enjoy children’s moments with our kiddos, and listen to a message from one of our pastors. During Christmas, you may lay cloth over the cradle to welcome the ChristChild. 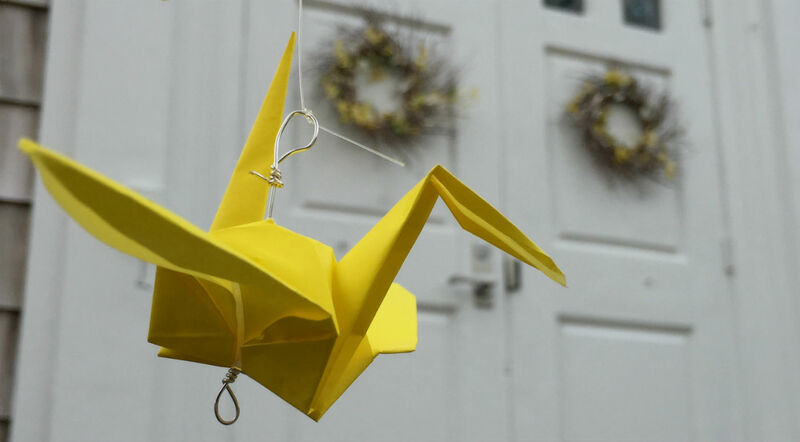 On Easter Day, we may float hundreds of prayers written on peace cranes and attached to balloons or hear our Choir sing and Bell Choir play from Jesus Christ Superstar. You might arrive in August to find we have a full band during CraftFest. You might hear Lady Gaga or Taylor Swift and Bach in the same service or join with the congregation in blessing the waters gathered from around the world for baptism. Worship with us matters. It’s meaningful and helps make meaning in our lives. It’s new, yet familiar. 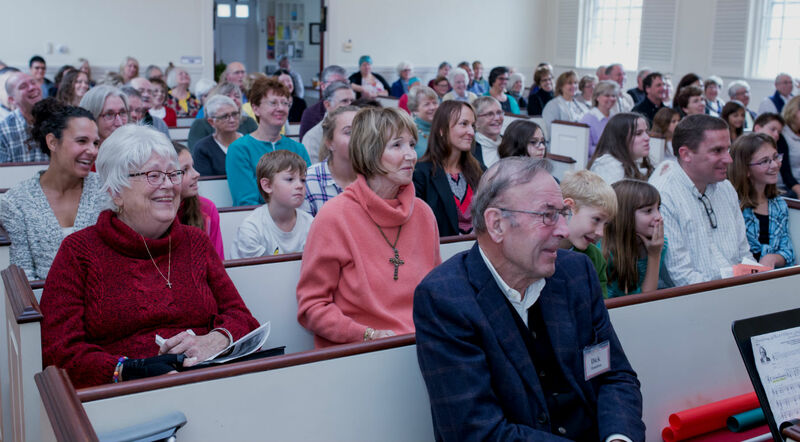 Cotuit Federated Church is renewing, relevant, and refreshing. We would love for you to experience it for yourselves. People usually begin gathering in the worship space around 9:45am to connect with one another and find a seat. Worship begins at 10:00am with announcements and passing the peace. Passing the peace is an ancient Christian ritual where we first offer peace of Christ to those around us. There are many options for parking. For most Sunday Services, there is parking at the Post Office, the Cotuit Library, and the lot at the corner of Main and School Street. There is also parking along School and High Streets. What do I wear to worship at Cotuit Federated Church? Whatever you want. Some people wear jeans, others prefer to dress up a bit. God doesn’t have a dress code, so come join us in clothes that make you feel most comfortable. Children are always welcome in worship. Services include a children’s moment where the week’s message is adapted for a younger audience. 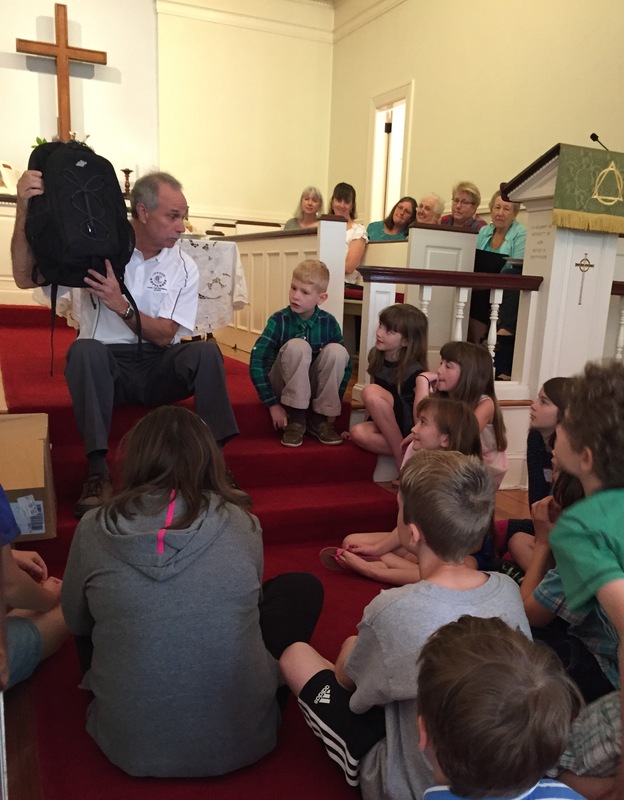 During the school year, Church School takes place most Sundays during the service. Loving and safe childcare for babies and toddlers is available each Sunday. Children may be brought to the nursery before the service begins or during the service. CFC loves music! We are blessed with an extraordinarily talented, supportive and energetic music director who guides the choir, handbell choir, and volunteer soloists in learning and expanding an eclectic repertory. She works in close collaboration with the pastor to help bring scripture to life with time-honored hymns, classical and contemporary church music, sung prayer, and even Broadway favorites. Are you hurting? Pray. Do you feel great? Sing. Are you sick? Call the church leaders together to pray and anoint you with oil in the name of the Master. Believing-prayer will heal you, and Jesus will put you on your feet. And if you’ve sinned, you’ll be forgiven—healed inside and out. Cotuit Federated Church is a place of prayer. We commit to holding one another and our world in the light and love of God. Our Prayer Circle meets every Wednesday in the Pastor’s Study at 9 am. We pray for the requests written on prayer cards during worship and emailed into the church office. We pray for the silent prayers that are carried into our sanctuary each week. We pray for the headlines in our newspaper and for the healing of the nations. Whenever you have prayer needs, share them with us — we will carry your joys and concerns with you. Join our small group of meditators who practice this ancient art on Monday mornings from 10:30-noon in the Kraft Room. Our practice is a fusion of lovingkindness meditation, mindfulness meditation and mantra practice. One of the great benefits of meditation is learning the ability to quiet the anxieties and worries of the mind when we are faced with challenging circumstances in our lives. It is a truly healing practice. There is no experience required to join this class…..so just come on down and check it out! There is a $10 suggested donation per class for the instructor. 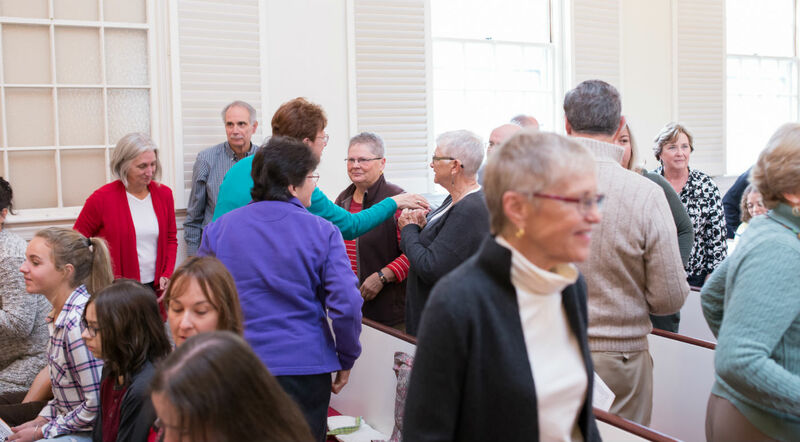 At Cotuit Federated Church we believe that when we celebrate communion, it is not Cotuit Federated Church’s table; it is not the table of the United Church of Christ or the United Methodists; it is the table of Jesus. All who hunger and thirst for God’s presence, who long to walk in the way of Jesus, and who are moved by the Holy Spirit are welcome to gather at Jesus’ table with us. God’s children of all ages are invited to receive the Communion at Cotuit Federated Church. No one is too young or too old to receive this sign of God’s grace — all are welcome to receive the love of God. Communion is celebrated the first Sunday of the month. It is often offered by intinction, coming forward and taking a piece of bread and dipping it in the cup. Grape juice is used in place of wine because of our commitment to a common cup and our support of those who are in recovery. 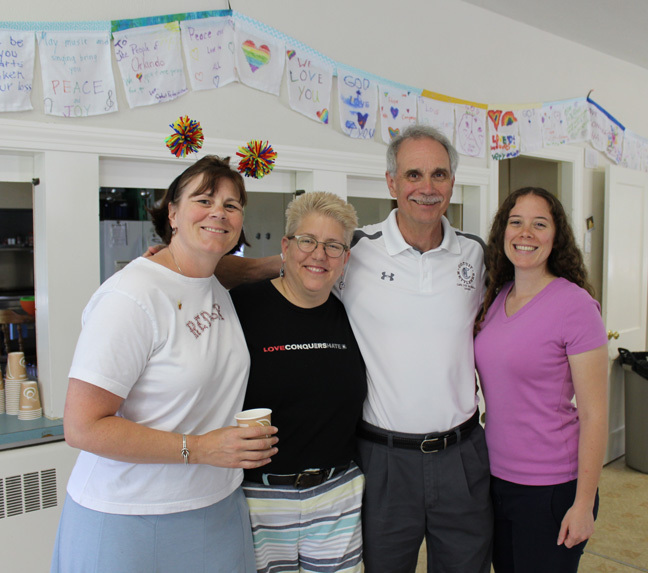 At Cotuit Federated Church, the sacrament of baptism is an outward and visible sign of the grace of God. Through baptism a person is joined with the universal church, the body of Christ. In baptism, God works in us the power of forgiveness, the renewal of the spirit, and the knowledge of the call to be God’s people always. The act of baptism also marks the beginning of new life of discipleship with Christ, the human response to that gift. We baptize people of all ages — infants, children, youth and adults. For infants and children, as well as for youth and adults who have never been baptized, baptism marks their acceptance into the care of Christ’s church, the sign and seal of God’s grace and forgiveness, and the beginning of their Christian faith and life. Water is an essential element of baptism. Water is a prominent symbol of cleansing and life in the Bible — the water of creation, the great flood, the liberation of Israel through the sea, the water of Mary’s womb, the baptism of Jesus in the Jordan River, the woman at the well, and Jesus’ washing of the feet of the disciples. That is why water is visibly present during a baptism. 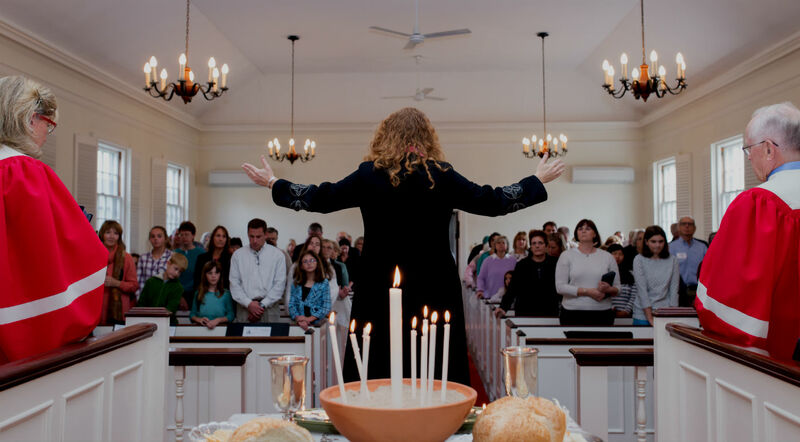 At Cotuit Federated the whole congregation is invited to participate in creating this sacred ritual. Together, we bless our new brothers and sisters and siblings in Christ. As a symbol of this participation in blessing, our congregation collects small vials of water from places we find holy. This water is purified and used when we bless babies at baptisms and for other special worship services. Waters from places nearby like Loop Beach and Cotuit rainwater converge with water from family cabins in New Hampshire and family vacations in the west; our holy water touches the Holy Water from the Vatican; these waters mingle with droplets from Paris and China and Rwanda; and our baptism water echos the baptism of Jesus with water from the Jordan River. Our sanctuary, which sits on the Cotuit Village Green, holds a maximum of 150 guests and is perfect for small, intimate weddings in a quaint New England village setting. Our minister, organist, and other members of the staff are available to assist couples in making decisions related to being married in the church. All couples who will be married at Cotuit Federated Church are asked to complete premarital counseling with the Pastor. The church office provides couples with a fee schedule associated with weddings at Cotuit Federated Church. Christian funeral and memorial practices are rooted in an understanding that the passage from life to death is a pilgrimage with and toward God. It is a privilege and a profound act of love to do those “last things” that human hands and hearts can do for our loved ones at this time. The Ministry of Last Things is intended to support, comfort, and empower us in end-of-life matters. Our congregation makes copies of Five Wishes available as a resource for families to have conversations around end-of-life plans. Five Wishes is a helpful guide and can document your wishes. Funeral and memorial services provide an opportunity to remember and give thanks for the life of the person who has died, to offer this loved one to God’s eternal love and care, and to proclaim the promise of Christ’s resurrection. These services typically include eulogies or words of remembrance, pastoral words, deacons condolences, scripture readings, prayers, and hymns. Our pastor will be glad to work with you to plan a funeral or memorial service that honors your loved one.